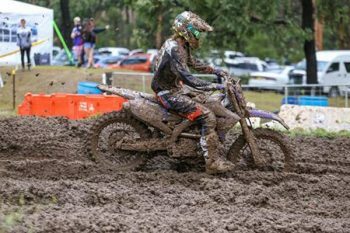 The first round of the MX Nationals, held at Appin, south-west of Sydney, was reduced to just a single six-lap moto for each class after intense rain saw the circuit descend into deep, sticky mud that even the most acclaimed riders in Australia found difficult to navigate. CDR Yamaha Monster Energy’s Kirk Gibbs banked solid points with third in MX1, Yamalube Yamaha’s Jay Wilson took second in MX2 and Maximus Purvis rode incredibly well to secure first in MXD. With Williams Event Management making the call reduce each race to six laps, as well as cancelling superpole and the second round of races, the pressure was on each rider to perform in the almost impossible conditions. Clean starts and keeping the bike upright being the most widespread advice from all teams. Dunlop motorcycle tyres are proudly distributed throughout mainland Australia by Ficeda Accessories. Tasmania retailers should direct enquiries to Fulton Enterprises.